To advance the dialogue surrounding the costs of cloud computing, I, together with Google and Analysis Group, created a comprehensive model that estimates the cost of the cloud for small and medium-sized businesses (SMBs). Using this model, I find that SMBs stand to realize significant cost savings by moving on-premise IT to the cloud. By concentrating on SMBs, I focus on 99.6% of businesses in the U.S.1 that account for 82.7% of non-farm and non-government employment.2 SMBs lack the constraints and legacy costs of their larger counterparts, allowing them choose the type of IT that fits best; thus, SMBs are typically the bellwethers for the future of enterprise computing. My comparative cost model includes common characteristics of businesses, such as the size of their company and the age of their on-premise IT, and allows users to adjust and tailor the model to their business. To determine how the costs of the cloud compare to on-premise IT, the model allows users to select a number of cloud computing services that cover the most common needs of SMBs, including email, office productivity software, accounting and finance software, CRM software, and file and print functionality. 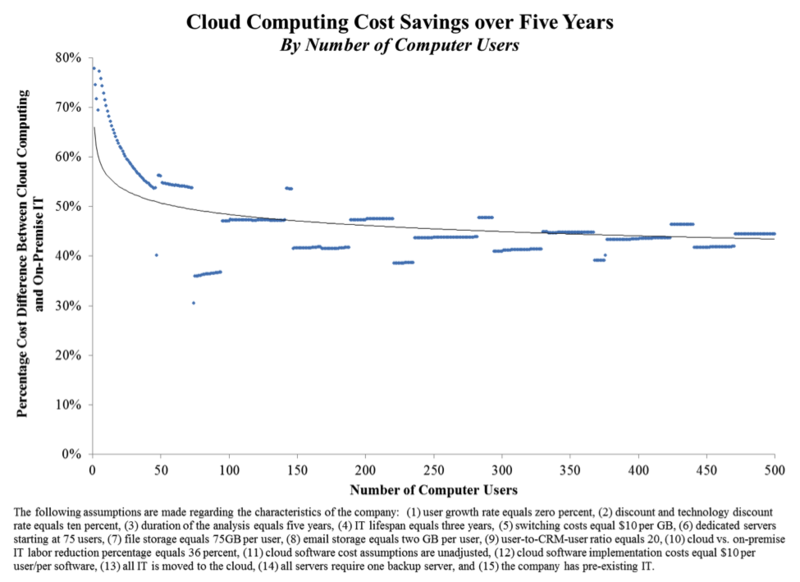 One of my principal findings, reported in my paper “Is the Cloud Cheaper?,” is that while the total cost savings associated with cloud migration increase with firm size, the largest percentage savings are realized by small firms. The chart below illustrates this latter point by showing that the average cost reduction for the smallest businesses (with 1 to 15 computer users) is approximately 71%, compared to 44% for medium-sized businesses (with 101 to 500 computer users), when all IT is moved to the cloud. The chart above, which shows the percentage cost difference between cloud computing and on-premise IT over a five-year period by number of computer users, plots both the output from the model (in blue) and a smoothed, fitted line (in black). At times, the model output is discontinuous because some costs support multiple users and therefore are only added at certain thresholds. As the number of users increases, firms may, for example, install extra on-premise servers to provide sufficient IT resources to their users. 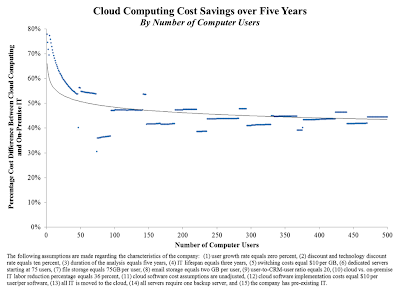 I also find that expected reductions in IT staff are important determinants of the total cost savings associated with moving to the cloud, but that savings are available even absent IT staff reductions. In addition, while these savings decline as a firm’s cloud data storage requirements or the costs of storing data in the cloud increase, I find that even with a 10x increase in cloud subscription costs, the cloud continues to offer significant savings when compared to traditional, on-premise IT. Thus, although savings vary based on an SMB’s characteristics, they are generally significant and suggest that companies will benefit by moving their IT to the cloud. 1 United States Bureau of Labor Statistics, “Table G. Distribution of private sector firms by size class: 1993/Q1 through 2011/Q1, not seasonally adjusted,” http://www.bls.gov/web/cewbd/table_g.txt. 2 United States Bureau of Labor Statistics, “Comparison of All Employees, Seasonally Adjusted, before and after the March 2011 Benchmark,” ftp://ftp.bls.gov/pub/suppl/empsit.compaes.txt. Andrew McAfee is a principal research scientist at the Center for Digital Business at the MIT Sloan School of Management. He also authored Enterprise 2.0 and co-authored Race Against the Machine.